Baker Perkins is launching a wash-down Accurist2.1™ bread dough divider in response to bakers’ increasing focus on improving hygiene. All mechanisms between the frames of the divider are now made from stainless materials. Sealed-for-life bearings enable chemical foam-and-rinse cleaning of all areas of the divider where oil and product debris many collect. Allergens and pathogens are a rising concern for the bakery industry, and are most reliably removed by these methods. Wash-down allows the thorough cleaning the industry now demands: the divider can be wheeled away from the production line to prevent cross-contamination. The new Accurist2.1™ retains the scaling accuracy proven in over 600 bakeries worldwide. High scaling accuracy of 2.5 – 3.5g SD is consistently achieved on 900g pieces over extended periods of operation. Advanced control technology and proven mechanical design ensure this ram and knife divider handles the dough very gently, providing excellent product quality. The Accurist2.1™ is automated, and servo control reduces dough damage by minimizing shear, compression and ram movement. Pressure on the product is cut, reducing dough stress whilst maintaining scaling accuracy. Quality benefits include up to 15% increase in cell count, up to 20% increase in softness, greater volume, improved crumb development and better color. The Accurist2.1™ minimizes cost through consistent scaling accuracy, and by innovative die design which minimizes oil consumption and dough leakage. Wear is also reduced by efficient lubrication, minimum ram movement, low pressure operation and long life components (typically 24,000 hours for ram and knife, 16,000 hours for the die). 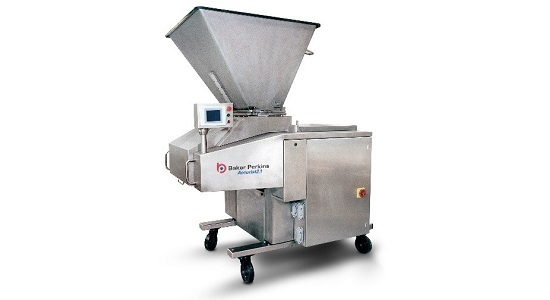 Baker Perkins’ dough forming systems all feature gentle dough handling to improve quality, with accurate weight control and high efficiency to minimize cost. Gentle dough handling is achieved through innovative design combined with the latest control technology to produces bread at new levels of consistency and excellence. Gentle treatment is identified by bakery industry research into dough rheology to be a significant contributor to superior product excellence and value.